All major credit and debit cards are accepted, along with cash. Cheques are still accepted. However, clients should be aware that they attract bank processing charges of £1 each. American Express cards are accepted as a last resort - as a small business we seem to be sponsoring their promotions with higher charges and the delayed receipt of payments. Pensioner Specials are available for the second and subsequent treatments only, once it has been agreed at the initial assessment that 20 minutes will suffice. Pensioners are considered to be in their sixties or beyond. The clinic in Woodford Halse is generally open at the following times. Since reception cover is required, prior appointments are required. Premium sessions incur an additional charge, since outside of normal 9am - 5pm office hours. They are intended for those who work some distance away and prefer not to take time-off for having their podiatry treatment. Thus the availability of Friday evenings or Saturdays afternoons, with advance booking required to ensure that we're on site. Home visits are exceptional, available to regular clients when convalescing at home and are priced accordingly. Much has been invested in the assessment and treatment facilities available in the clinic, which are not available when visiting clients in their homes. Taking a bottled milk analogy: drive to the supermarket and it's cheaper; having it delivered to your doorstep costs much more! There are no 'cures' for plantar warts, or verrucae as they are called when on the feet. They are caused by the Human Papilloma virus, of which there may be eighty variants. Like the common cold viruses, they are too small and too varied to develop a specific cure. However, there are many treatments! These may be considered as causing a mild irritation or wound, to stimulate your immune system response. Foot Wise Podiatry offers a range of acid and cryotherapy treatments, to help you win this battle. These may be purchased as one-off treatments, or as a discounted course. MARCH 2017 sees the addition of SWIFT microwave treatments, using heat-shock to stimulate your immune response. With just two x two second applications per location, the treatment is fast, does not puncture the skin and does not require any anaesthetic - it is safe and highly effective, even with previously unresponsive warts. A completely fresh approach, with proven clinical pain relief and effectiveness, even on nail margins and within clefts (previously un-treatable with cold or acid) . Trials show that those of mid-life and beyond may required three or four sessions for complete resolution; younger people respond more quickly (life is so unfair!). 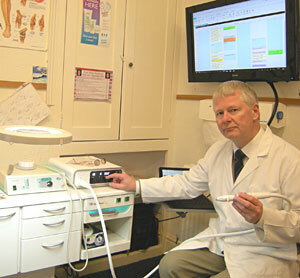 SWIFT microwave is an Emblation company, with its pioneering technology designed and developed in the UK! Thickened, crumbly, streaked nails are often characteristic of a fungal infection, which can spread from nail to nail over a few years. 90% of fungal nails are caused by the same infection as Athlete's Foot, typically Trichophyton rubrum - a fungus that likes to eat keratin, the main component of your skin and nails. Foot Wise Podiatry offers a range of topical and more determined treatments for the removal of fungal nails. Since the fungus 'deadens' the nailbed, these treatments are usually without any pain or discomfort. Traditionally the resolution of dry, cracked and painfully fissured heels was a slow process... involving much cutting-away, filing and softening with urea-based moisturisers. But no more!! Foot Wise Podiatry uses a medical grade adhesive called LiquiBand Optima, which retains flexibility as well as strength when 'zipping-up' painful fissures. It is a non-toxic 'super-glue' that remains in place for about 5 days, whilst normal skin has the opportunity to develop beneath it. Since tearing is prevented at each end of the fissure, there is usually immediate and lasting pain relief. LiquiBand is water-resistant and withstands short showers, but not swimming or immersion in a bath (soggy skin makes it come away too quickly). LiquiBand Optima is anti-bacterial. However care is required to avoid trapping any deep infections beneath the adhesive. It also cannot be used on currently bleeding or weeping lesions. For this reason, LiquiBand is not licensed as a self-treatment product, but must be administered by a qualified medical person, with appropriate after-care available. Foot Wise Podiatry can add LiquiBand as an adjunct to a current treatment, or offer it as a separate stand-alone treatment. Clinical testing indicates there is a low recurrence rate for fissures treated with LiquiBand, though subsequent filing and moisturising may be required, depending upon the skin characteristics. When a nail edge becomes repeatedly infected and the usual efforts to re-educate its growth and proper cutting have failed, then a minor surgical procedure may become appropriate. The procedure itself takes 10 minutes. However, you should allow a hour for the medical paperwork and a rest afterwards with your foot raised (time for a cup of tea!). Having taken your medical history and written consent, local anaesthetic is first used to numb the four nerves supplying the toe. The area is cleansed using a strong iodine solution. Once we are sure that you cannot detect any pain or discomfort, we then remove the troublesome side of the nail (a partial nail avulsion) or more rarely the whole nail (if both sides are troublesome and the nail is particularly narrow). To prevent re-growth of the nailbed, Foot Wise Podiatry uses a couple of drops of a strong caustic called Phenol. This has the advantage of killing any deep infection and also of deadening the local nerves - hence less post-operative pain. However, being a strong acid, the superficial skin is sloughed-off over the following couple of weeks (as with a severe burn from a cooker). For this reason, tepid salt water bathing is recommended every other day at home, followed by application of clean dry dressings. We tend to perform the procedure in the afternoon, so that you can go home and rest with your feet up, to help with the blood clotting. You may retire to bed for a normal night's rest, taking a couple of your usual pain killers if necessary (NOT aspirin). You may continue with light duties, your normal schooling or work activities on the following day. Strong physical exertion, swimming or strenuous sports activities are not recommended until the toe has stopped weeping. Ignoring this advice is likely to damage the delicate, regenerating tissues, to slow your healing and to encourage an infection. There is the possibility that the troublesome nail will re-grow as before, particularly if you bleed more than is normal during the procedure, neutralising the Phenol before it has had its effect. You are not insured to drive with an anaesthetised toe, since your reaction times and emergency braking may be affected. Hence you must be accompanied and then driven home after the surgery. You also need to bring some open-toe sandals on the day of the surgery, since for one night only you will have a rather large toe bandage! We ask you to return to the clinic on the day following the procedure, to receive further instruction on salt water bathing and how to apply dressings, so as to keep the toe as clean and dry as possible. We then review your progress at fortnightly intervals, using digital photography to monitor progress, until all weeping of the toe has ceased. The initial procedure and all follow up appointments are sold as a single course for a fixed fee. You are expected to purchase dressings and apply them yourself at home - a 5% discount has been arranged for you with our local pharmacy - Popson's Chemist.